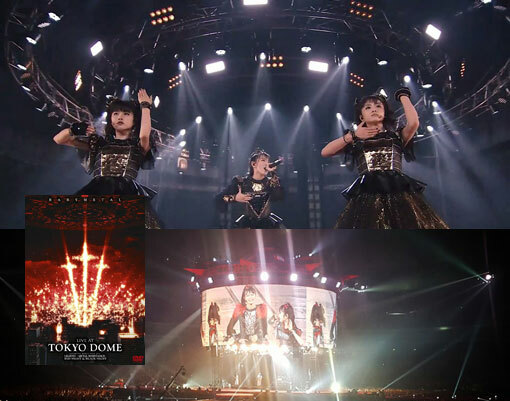 Since I only discovered Babymetal as late as in March 2017 (still kicking myself for my late arrival too), I was knee deep into checking all this out when the official trailer for “Live At Tokyo Dome” popped up that very month on the 15th. It was obvious that the band I had just fallen in love with had done serious business in Japan. Two nights at Tokyo Dome (110,000 tickets sold) is quite awesome. I now know that it took over 1,000 people to carry out this operation. The stage itself – taller than most buildings in my city, a beautiful yet monstrous creation – built and taken down inside 24 hours before and after these shows (Red Night on September 19 and Black Night on September 20) for this to have worked out at the prestigious arena. I mean, clearly somebody deserves a friggin medal for what they all accomplished with the stage alone, never mind making it all work. Having said that, I think some kind of bonus feature on this DVD package (released in April 2017 in Japan, I just got my copy a few days ago on import) would have been nice, some behind the scenes stuff. But on to the DVD. Let us begin with the track lists of the two nights for easy viewing. Red Night (Disc 1) – 1. “Road Of Resistance”, 2. “Java!”, 3. “Iine!”, 4. “Syncopation”, 5. “Amore”, 6. “GJ!”, 7. “Rondo Of Nightmare”, 8. “Song 4”, 9. “Catch Me If You Can”, 10. “Gimme Chocolate! !”, 11. “Karate”, 12. “Tales Of The Destinies” and 13. “The One” (English version). Black Night (Disc 2) – 14. “Babymetal Death”, 15. “Awadama Fever”, 16. “Uki Uki Midnight”, 17. “Meta Taro”, 18. “Sis. Anger”, 19. “Akatsuki”, 20. “Onedari Daisakusen”, 21. “No Rain, No Rainbow”, 22. “Doki Doki Morning”, 23. “Megitsune”, 24. “Headbanger!” and 25. “Ijime, Dame, Zettai”. You will notice that I counted 25 songs over two nights. That is really what happened here. They did not repeat any numbers on the second night, so this was really a massive showcase of pretty much every song that they have ever released. The winners must have been the fans that bought tickets for both nights. Watching this on DVD works fine too, and here it is. Two completely different shows in two days. Imagine the work involved for everyone to pull this off. As for the girls, that is a lot of moves right there. But this is Babymetal. This is the level of sheer professionalism that we are seeing here. They are a cut above the rest, no doubt. Amazingly, both nights work well as they are. Not one single song feels like it is out of place. I can imagine that we may have seen some songs for the last time here, especially once they have got a third and a fourth album out. I suspect that “Live At Tokyo Dome” will be seen as a vital document of everything that has gone down in history right up to this moment. As such, it is very unique. But as I said, both nights worked very well. Red Night opens with “Road Of Resistance”, girls on top of the stage with their flags, each positioning themselves on their own platform. Then all hell breaks loose as the song kicks in in ernest. Drones capturing all the action from on high, pyrotechnics going insane. It is one hell of an opening. A brief moment with the Kami Band out front and the girls are on stage (downstairs) to end the song there. Then you have the second song “Java!” with rotating stage, frantic stage moves and that weird Ska type rhythm. Then, Boom, it all continues with the insane “Iine!” complete with snippets of rap that is only there for bigger effect of monstrous riffs coming in. It is all high paced and entertaining with lasers and lots of worshipping going on. “Syncopation” follows and I really like this track. It begins with a pulsating heart that beats faster and faster and Boom, they rock. This is Metal and Pop fused beautifully. I think they could lift this song to represent this release. Then we have Su-metal taking over the top stage for “Amore” and it is beautiful. Very theatrical. Again, loads of fireworks, loads of guitars. She is the Queen of Kawaii Metal. “GJ!” sees Moametal and Yuimetal take on the crowd and they are cute as hell as they bring down the house. This reminds me of Queen. The big singalongs are very arena friendly. Some very cool moves here and I like the pumping riff. “Rondo Of Nightmare” follows and Su-metal is in full Queen mode again. Rotating stage, flames reminding you of Budokan. Very dramatic. “May the 4th be with you” a voice says (there is more, this is Babymetal after all) as they borrow a bit of cultural history from “Star Wars” as only they could and Yuimetal and Moametal are off doing their thing again with the catchy “Song 4” which is the most childish song they have done (and the reggae bit is a bit unnerving, but I know it is there for effect). Very cute, with a relentless Judas Priest type riff holding it together. They are all over that stage saying Hello to the crowd, it is a celebration of life. The fact that they pull a song like this off is amazing. Then you have the Kami Band doing their thing and “Gimme Chocolate! !” has Su-metal talk in English. “Hey guys. What is up? Hey everybody clap your hands. Let us sing together now. Are you ready Tokyo Dome?”. Maybe this song will be picked to represent this DVD? Or maybe they are just moving out to the big world little by little, and Su communicating in English being a result of the international work? I like it. I always loved the part where the girls are running all over the stage during the guitar solo of this song and it looks like so much fun. This is an insanely energetic version of this song. Then you have “Karate”, perhaps the coolest song in their catalogue. I love the girls moves as they dominate that stage. They pull it off, no need for video trickery at all. Another majestic singalong and Yuimetal looks genuinely moved (almost to tears?) and that touches my heart to see. They must be in awe of the love from the audience, always so supportive, always there for them. It is a family. The very intricate “Tales Of The Destinies” will never be a hit and they really push the audience with this Progressive Rock here, but the band pulls it off and the girls makes it all look great. They have a humour here that is priceless. This leads in to “The One” and the girls all appear in Golden outfits and makes full use of the long walkways/platforms that are designed for moments like this. Su is a very emotional performer, and here she is so precious. And so powerful. And this is the big finale of the Red Night, as 55,000 lights appears in the arena from all those neck corsets as they lit up on command by remote control. The visuals are amazing. It is a beautiful moment in their career. It goes on for quite a while but this is the true connection between the people on that stage and the 55,000 that are there to show them just how much they love them. It all ends on this Epic note. Then on to Black Night. How could you possibly top Red Night I wondered? Well, you open with “Babymetal Death” for starters. Everybody expects the girls to appear on top of that stage as the drama kicks off, and indeed it looks like they are standing up there. Then suddenly they appear on crosses at the far ends of the walkways. Then the insanity that is Babymetal kicks off like only they can. This is very ritualistic in nature, very tribal. In fact, for any fan of Metal, this is irresistible. There is magic happening here and they make it all look easy. Trust me when I say that what they do here is anything but easy. But they are so spot on it looks like the most natural thing in the world. Most acts would have needed a 15 minute break after such an opening but Babymetal just go insane with the happy “Awadama Fever” and “Uki Uki Midnight” (again, with rotating stage). The slightly militaristic (?) “Taro” has shades of Deep Purple (“In Rock”) and Nightwish at the core of the music, but it is very Babymetal. First singalong of the night and everybody is smiling on that stage. It is like you have entered the Twilight Zone of Heavy Metal, where everything is happy and carefree. I like to be in this Zone. It only exists right here. It will soon be a memory (for a guy my age, a decade or two passes in a flash, so I have the outlook of a 56 year old). It is all so precious, so very precious. Then Yuimetal and Moametal do Metallica style “Sis. Anger” and the power on that stage is enormous. This is cool beyond belief. The Kami Band gets to shine some more (very powerful introduction, I half expected to see Ozzy appear on that stage!) and then Su-metal is back for “Akatsuki”. Again, a touch of Nightwish, and Su being the Queen that she is. Rotating stage, guitar exchanges, pyrotechnics gone wild. Again, shades of Budokan. The set clearly has a formula. “Onedari Daisuken” by “Black Babymetal” is next – that would be Yuimetal and Moametal (are they preparing us for a side project here I wonder?) being adorable all over that stage. I quite like this, it is very pleasing to the senses. Su appears again for “No Rain, No Rainbow” at the far end of one of the walkways but she will end up on the very top of that stage before the song is over. As the Kami Band entertains us there must be a lot of elevator action going on but it is quite beautiful. “Doki Doki Morning” then follows and the girls are way up there doing their thing. It is so happy, it all goes back to the innocent days here. “Megitsune” was also an early song, but very grown up in structure (and a sign back then that Babymetal had a lot to offer). Here it is quite majestic, beautifully executed (amazing lights). I thought that the Budokan show would be hard to top but they are still right up there, still right on the money. But the song has evolved through touring and here we get another extensive singalong. Then there is “Headbanger!” and this is a biggie, very ritualistic, very powerful and touching all at once. Lots of smoke. Babymetal on top of the world. Su hailed as the Queen. I realize that we have travelled backwards in time here and it all ends with “Ijime, Dame, Zettai”. Babymetal has conquered Tokyo Dome. Twice. This night they take a long hard earned bow and they are met by so much love it is an absolute joy to behold. I hear that Su fell during the long goodbye but this has been edited out (just like Yuimetal accidentally falling off the stage at the first Budokan night in 2014 was cut out). It is all smiles and Su pulls a visual joke on Moametal as they take their goodbyes. “We are Babymetal” is finally repeated a few last times on the top of that stage, and it all ends with Su hitting the Gong with one hell of a bang. On the visual side, Babymetal has just ended another perfect performance on a high note. The audience is left with the message that Babymetal has new adventures ahead in their travels across the Metal Universe on their holy mission of Metal Resistance. Only the Fox God knows. Final words. “Live At Tokyo Dome” is a game changer. They totally deserve to be this big all over the world, not just in Japan. With luck, they could end up like Queen, as the Ultimate Entertainment Package, only in a genre of one. This has the strength to last, the strength to captivate millions and give them some well deserved happiness on the way. The Metal fans, and yes we are mostly men, love this on many levels. We love the music, the Kami Band, the whole nine yards. But we also love the girls. For their professionalism, their personalities and the amazing performances. I think I talk for many fans when I say that I love them like they are family. They are like your little sisters or kids (a little bit depending on your age here). It makes you happy when you see them do well. And if anybody ever causes trouble, that would be the quickest route to a nearby hospital that you ever saw. We are one. Am I exaggerating too much? I don´t think so. Babymetal is the best thing that has happened to Metal in decades. The world needs some happiness and here it is. The record companies that represents Babymetal in Europe and the US needs to pull out all the stops for this release. This is their “Made In Japan” (no pun intended, but I think it is appropriate to compare this to the Purple classic that changed their career forever back in 1972-1973). This is the big one. Come this Fall, I fully expect just that. Anything else would be criminal. And if I can help out in any way, I am right here, ready and willing.